We all as children have grown up listening to our mothers telling us how green plants and vegetables are of utmost benefit for our health and body care. Plants and vegetables are not only beneficiaries for our inner body, but also for the outer body as they make our skin radiant and hair smooth and silky. One such magic plant is Aloe Vera. Aloe vera is a quintessential plant which has various health benefits and antibacterial properties. It has cactus-like leaves which contains a gel-like substance in it. This gel is the true and the only essence of the aloe vera plant. The Aloe vera gel is used all over the world for various uses which include healing properties, anti-inflammatory properties, anti-fungal properties, and antiseptic properties. It is for all these reasons that cosmetic industries all over the world have included aloe vera as one of the main and essential ingredients in their products. The Aloe vera gel is a rich source of various vitamins and contains 96% water which helps in moisturizing the skin and also providing the crucial vitamins to the skin for rejuvenation. Also, aloe is a miracle product for providing nutrition to the skin and releasing of toxins which helps in further enhancement of skin and hair. Aloe vera is not only helpful for skin. It is also does great wonders to the hair as well. Aloe vera contains enzymes which help in repairing the dead cells on the scalp and conditioning of the hair. Also aloe vera gel helps in hair growth and reducing itchiness from the scalp. Aloe vera does wonders for removal of dandruff. Having dry skin is a problem for the majority of people, especially in the winters. But not to worry! Aloe vera gel is the perfect solution for all the skin related problems. Applying a paste of a mixture of aloe vera gel, a pinch of turmeric powder, few drops of rose water, milk and a teaspoon of honey can help get rid of dry skin completely. Apply the paste and keep it for at least 15 to 20 mins. Then rinse off with water. Repeat daily for maximum results. Exfoliating two to three times a week is very essential for the removal of dead cells from the skin. The exfoliating gel made out of aloe vera not only exfoliates but also helps in declogging of pores. To make an exfoliating scrub, mix half a cup of aloe vera with a half cup of sugar and 2 tablespoons of lemon juice. Lemon acts a bleaching agent which helps in diminishing scars and marks on the skin, sugar helps in removal of dead skin and aloe vera helps in deep cleansing of the skin. This scrub can be used on body as well as face. Acne is one problem of which majority people have been prey at some or the other time in their life. For the easy and quick removal of acne breakouts, aloe vera is a miracle product. In a blender, blend some aloe vera, walnuts and honey together. Aloe vera has healing properties which combined with antioxidants in honey, leaves the skin feeling fresh and clean. Apply this mixture on the affected area and see the acne vanish away in no time! Sensitive skin is the skin type which needs the most care of all the skin types. Aloe vera is one of the most important remedies for sensitive skin. To make a soothing mask for sensitive skin, mix some aloe vera gel, cucumber juice, yogurt, and rose oil. Blend all the above-mentioned ingredients till it becomes a paste. Apply the paste and leave it to dry for a period of 20 mins. Rinse it off with water and pat dry. Apply this mixture 2-3 a week and see the glowing change on your face. Direct application of aloe vera gel on the face or body acts a vitamin-rich moisturizer. It makes the skin feel fresh and new. The strength and the volume of hair depend upon the quality of the hair. To enhance the quality of the hair it is important to take proper care of the hair as they are exposed to different harmful articles in our day to day life. To make a perfect hair pack, mix some aloe vera juice with coconut oil. Apply the mixture directly to your hair and leave it for at least an hour. Wash normally and let them dry naturally. You can repeat this every 15 days to give your hair a bouncy and silky look. Aloe vera is a knight in shining armor for getting beautiful and silky hair. Aloe vera is a great conditioner for the hair. It can be applied directly onto the hair. Extract aloe vera gel from the aloe leaf and directly apply the gel to your hair. Let it sit for at least half an hour. Wash your hair normally. You can also apply aloe vera gel as you apply your normal conditioner. After rinsing off the shampoo from your hair while taking a bath, massage aloe vera gel into your hair. Let it sit for 2-3 mins. Rinse off with water. You can use aloe vera as a conditioner daily for giving your hair a new and fresh look. 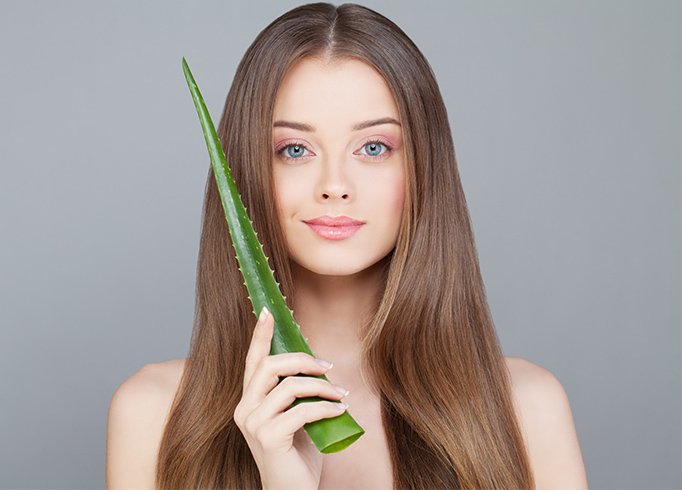 The inclusion of aloe vera in your daily skincare and hair care routine is very beneficial. The vitamins present in aloe vera gel are unmatched to any other product. Everyone should include aloe vera in their daily routine, either for rejuvenation of their skin or making the hair smooth and silky.